UNITED NATIONS, September 8 -- While in Sudan the UN claims to be “insisting” on its rights to free movement under its agreements with the government, in practice the UN refuses to go out to sites where civilians have been killed without first receiving government approval, it has emerged. The most recent case in point is the Tabarat Market in North Darfur, where more then 50 people were killed earlier this month. As Inner City Press documented with internal UN documents, the UN peacekeepers nearby at Tawilla told relatives of those killed and injured that they could not go to the site without approval from El Fashir, and it now appears clear, from Sudanese authorities. On September 7, UN acting Deputy Spokesman Farhan Haq told Inner City Press that “this process of approval is a standard procedural process.” Since the Security Council has given the UN Mission, UNAMID, a mandate of protecting civilians, for Haq to call awaiting approval to offer protection “standard” seemed strange. Later on September 7, Inner City Press asked UN Peacekeeping deputy chief Atul Khare about the restrictions which Haq had called standard. 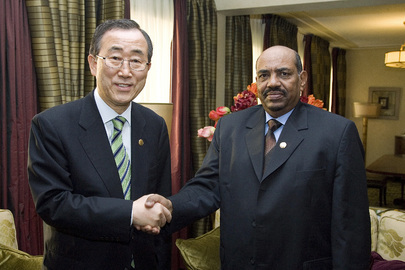 Khare intoned that such restrictions would be in violation of the UN's agreements with the government of Sudan. The UN accepting this restriction seems to contradict what Atul Khare said on September 7, video here. It also seems to contract what Haq told Inner City Press, that “on 7 September, a UNAMID mission traveled to Tawilla to further assess the impact of the violence.” Rather, UNAMID describes a convoy from El Fashir to Tabarat being stopped and not allow to proceed. But the delay from September 2 to 4 was not based on any communication of danger by the government, rather on a policy of not moving out from a UN base like Tawilla, even to a site of killing of civilians like the Tabarat Market, without approvals from El Fashir and, it's clear, the government of Sudan. Inner City Press asked Haq to explain the delay announced by the UN peacekeeping “people at Tawilla” on September 2. “I don't speak for the Tawilla people,” Haq said, refusing to take any more questions on the matter. 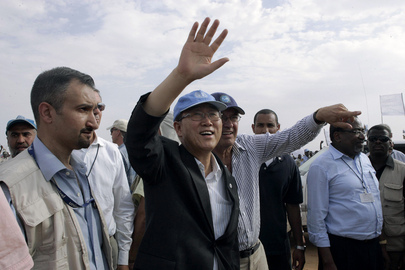 Sources in Sudan tell Inner City Press that it is well known that the UN accepts restrictions on its movement. In fact, even the UN's John Holmes, before he left, said that the UN has since February accepted a restriction on any movement to Jebel Marra. According to Khare, this violates the UN's rights to movement under its agreements with the government. Why dissemble about it? Where is the Security Council, and members like the U.S. -- silent so far on this -- the UK and France -- on this? Watch this site. 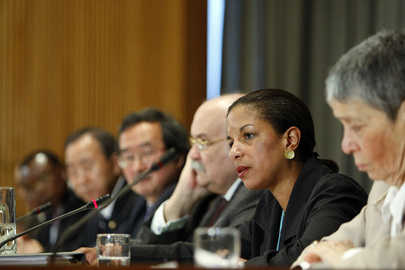 Here's from the UN transcript of its September 7 noon briefing; the September 8 is online here. Inner City Press: There’s also, and I’m sure African Union-United Nations Hybrid Operation in Darfur (UNAMID) is aware of this, reports that UNAMID said they confirmed some of, of up to 37 people killed in a village, in a market — Tabarat Market near the town of Tawilla — that said that the United Nations peacekeepers were told of the attack and said that they could not go to pick up even the wounded until they got approval from Al-Fasher. What I want to know is whether, how long it took them to respond and whether this approval included approval from the Government in Khartoum and if so, whether if any of the people expired there of their injuries might have been saved had the United Nations actually gone to protect civilians? Spokesperson Haq: Well, first of all, this process of approval is a standard procedural process. But in terms of the details, on 4 September a UNAMID patrol gained access to the Tabarat area. It observed that Tabarat was practically deserted and reported the presence of Government police in the area. Today, 7 September, a UNAMID mission travelled to Tawilla to further assess the impact of the violence. UNAMID has made efforts to assist in evacuating some of the injured victims by air to Al-Fasher. In terms of our estimated casualties, the Tabarat incident left more that 50 people dead and a large number injured. Inner City Press: Tawilla, to my understanding there’s a Peacekeeping unit there… that there are peacekeepers stationed there. Is that true? So did UNAMID sort of buttress its presence there and why weren’t those people able to go after they were told by relatives of those injured that this attack had taken place in the market? Spokesperson: I think I have some further details for you for afterwards, but basically in terms of the ability to gain access, as soon as we gained access, that was on the 4 September, a UNAMID patrol did go into the area. The difficulty is in dealing with access to areas on the ground. Spokesperson: It varies from case to case, but ultimately it depends on dealing with authority on the ground to make sure that approval is in place for our deployment. 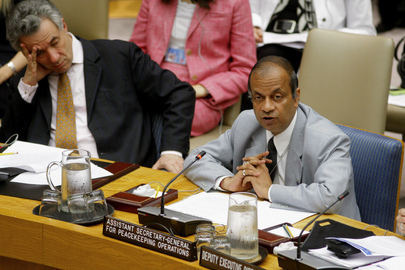 The video of Atul Khare saying that this violates the UN's agreements with Sudan is online here.